However, this feature currently seems available only to those using Blogger's default templates. Update: Soufiane of LeBlogger.com has kindly emailed me with a quick and simple solution for us to add the required code to customized Blogger templates! Details below. For those of you using a standard Blogger template, you should easily be able to add comment avatars to your comment section with just a few clicks. Go to Settings>Comments in your Blogger dashboard, and ensure the "Show profile images on comments" setting is set to "Yes" (this appears near the bottom of this page). 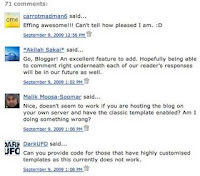 Check a post page on your blog which has some comments to see if any comment avatars appear. If no comment avatars are visible in your layout, go to Layout>Edit HTML in your Blogger Dashboard and click the "Revert widget templates to default" link near the bottom of the page. Warning - only do this if using a standard, uncustomized Blogger template! After completing these necessary steps, comment avatars should now display to the left of comments on your posts. Soufiane of Le Blogger kindly emailed me details of the code we can add to customized Blogger templates in order to make comment avatars appear beside our posts (take a look at this post for the original details, in French). It seems the method for us to use is far simpler than my initial impressions - we need only add two small sections of code to our templates in order for the comment avatars to function. 1. Go to Layout>Edit HTML in your Blogger dashboard, and ensure you check the "Expand widget templates" box. Depending on your particular template, you may discover this is <div id='comments-block'> instead. Note: if your template included div instead of dl, leave this intact and replace all other elements of the line instead. If you use an "author comment highlighting" hack in your template, you will need to search for a second instance of <a expr:name='data:comment.anchorName'/> and paste the code a second time. 5. Finally, save your template. Now when you view a post page for which comments are enabled, you should see avatars beside the names of respective commenters! 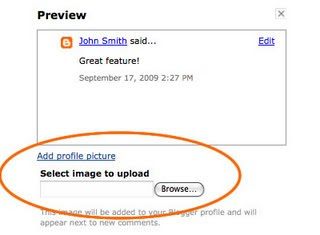 If you choose to comment using your Blogger profile and do not currently have a profile photo uploaded, you can quickly add a photo while posting a comment. To edit an existing profile image, go to your Blogger dashboard and click the "Edit Photo" link beside your current profile image. This is the image which will be displayed beside comments posted on Blogger blogs for which this feature has been enabled. Whose avatars will be displayed? At present, comment avatars are only enabled for those using their Blogger/Google profile for their identity. Those who use the "Anonymous", "Name/URL" or other options when commenting cannot yet have a profile image displayed. When using OpenID, Wordpress, LiveJournal, Typepad or AIM, the OpenID favicon will be displayed instead. Those commenting anonymously or using the "Name/URL" option will have no image displayed. Of course, there is every possibility that the Blogger Team may soon, enabling those using other methods of identifying themselves when commenting to upload a profile image for display. Can these profile images be styled differently? .avatar-image-container img - to style the actual image, using borders, padding, background-color, etc. I'll experiment with this in more detail over the weekend, particularly with reference to comment identities for whom avatars cannot be displayed (yet), and will post full details as soon as possible. The script used to display the avatars on post pages is set to load after other content on the page. This may mean a few seconds' delay between the initial page load, and the avatars appearing beside comments. I am very happy that we are now able to display avatars beside our comments, but still feel there is room for improvement, particularly as those who do not have a Google account are unable to display their profile photo. I hope that in the future, the ability for anyone to upload their photo will become possible (or that at least a generic image could be displayed instead). After I'd mentioned this on Twitter, I discovered some rather mixed reactions to the news - many complained that this feature should have been implemented far sooner, or expressed their preference for using Disqus comments instead. So what's your opinion? Will you use this new function in your own Blogger blog(s)? Please feel free to tell us your thoughts by leaving your comments below.